This book read like a tv show. 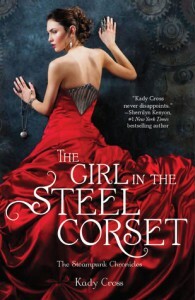 To be honest, a huge part of The Girl in the Steel Corset reminded me a lot of tv shows like Vampire Diaries and Pretty Little Liars—you know, teenagers running the whole show and doing ten thousand things without any adults and saving the day? Yeah. The book starts out fast, so make sure you guys read carefully and pay attention to some detail if you don’t want to be confused. It’s what worked for me. The characters honestly felt pretty developed to me. But they were completely unexplained in some parts and I hope the next couple of books in the Steampunk Chronicles answers them. Like, Emily has the skills of engineering, technology, science, and medicine? Where the heck did this girl even learn all of this from? The only explanation or job description I could possibly give her is that she’s a physician-scientist, and to be that you need to be certified dually in a PhD and MD (okay, that’s in today’s time, but you get what I’m saying?). So…? A lot of the things that were probably meant to be suspenseful were things that I guessed was going to happen, but from how I felt, this book is just a quick read. :D I’m guessing every book is a new adventure.